WhatsApp, the most popular / demanding Chat Application of the globe. Just imagine if you were unable to access / open WhatsApp Obsolete / Outdated Version, actually that feels worst. Normally, everybody gives the excuse about their busy schedule, if they were unable to complete any particular job on time BUT they never miss to check their WhatsApp messages. In simple words, people now a days are addicted to the WhatsApp, they can’t imagine any life without WhatsApp. This morning, while travelling to the office I had experienced a very strange situation. I tried to open mine WhatsApp but ended by getting the below message. This version of WhatsApp became obsolete on Dec 27, 2016. Please go to the Google Play Store to download the latest version. Your device’s date is Dec 29, 2016. If this is incorrect please correct your device’s date settings then restart WhatsApp. suddenly an IDEA came to my mind and I have decided to implement that act first. Would you believe, by implementing that idea I was able to get into the WhatsApp without downloading / upgrading WhatsApp. Anybody can be under same situation. 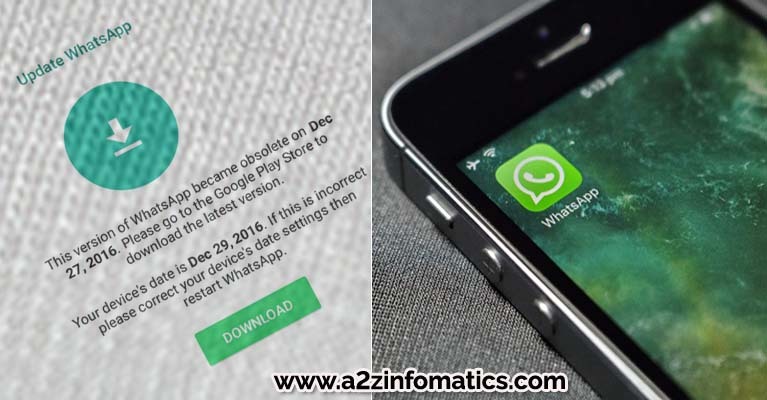 Don’t worry, after reading this post you will get the counter way / solution to open the obsolete version of WhatsApp without downloading / upgrading WhatsApp. To improve the user experience, each and every application provider update their application from time to time. In order to use the application without any flaws, we have to upgrade the application in a given time schedule. Same rules applies with WhatsApp too, once the update for the current WhatsApp version has been released and anybody haven’t or unable to upgrade that, current WhatsApp version becomes obsolete and stop working. The easiest way to get rid of this problem is to follow the download button given in the end of the “Obsolete WhatsApp version” message screen. It will take the user to the Google Play Store to download the updates for the current WhatsApp version. Recommended – Easiest Method / Way to access / open Obsolete WhatsApp version / Outdated WhatsApp version. 1)- Follow / Click the download button given in the bottom of “Obsolete WhatsApp version” error screen. 2)- It will land the user into the Google Play Store (android users) / iTunes (iPhone users). Just hit download / upgrade and the WhatsApp will start working normally as it always do. Who don’t care for their data connection bills. Who are nearby and have access to the un-metered WIFI network connections. Rest of the PEOPLE can follow the other method (given below) to open Open WhatsApp Obsolete / Outdated version. This is the recommended way if anybody cares for their data connection bills and isn’t nearby or don’t have access to the un-metered WIFI networks. How to Access / Open WhatsApp Obsolete / Outdated Version by changing DEVICE Date. Have you closely evaluated the “WhatsApp Obsolete Version” error message 🙂 . It pointed that, if this is not the current date please do change your device date and restart the WhatsApp 🙂 . Actually this trick has been inspired by the same lines. 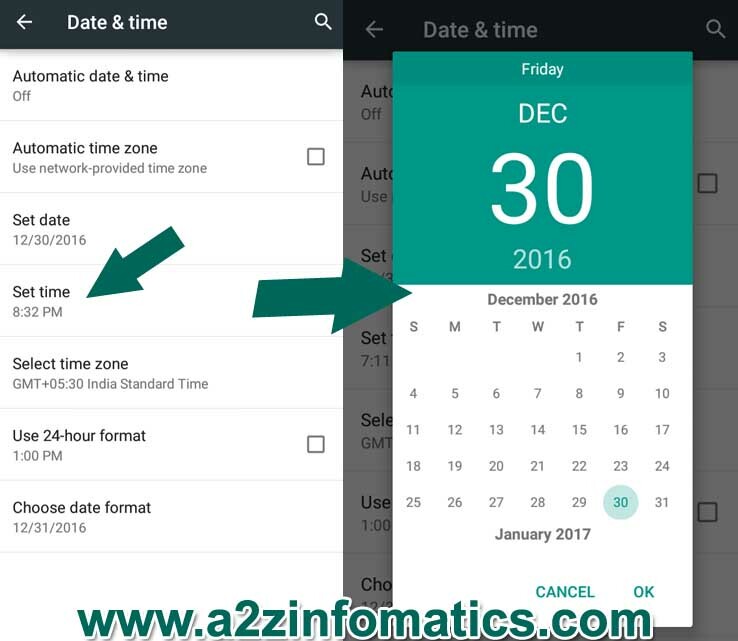 Below are the steps / demonstrations to change the system date settings in ANDROID device. Don’t worry iPhone / Windows / others users, you too will find steps helpful. 1)- Look for the Settings option in your device, Get into it. 2)- Scroll down and find the option “Date & time”, Tap to it & get inside. 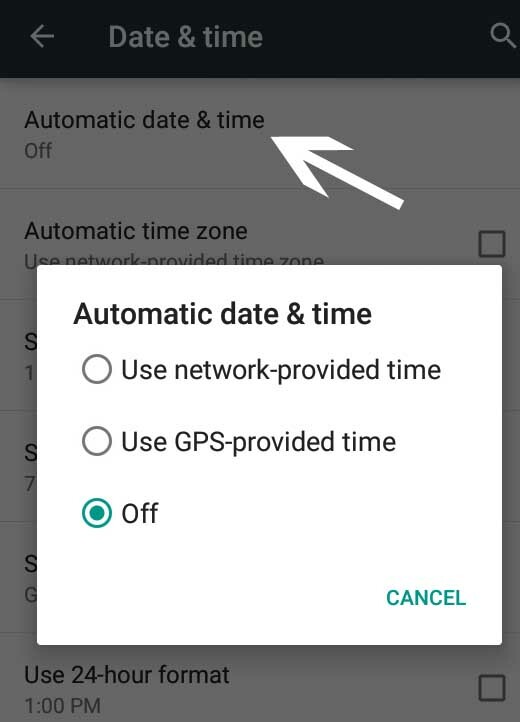 3)- On the next screen, You will find the option “Automatic date & time”, TAP / Click to it and you will be with 3 options (Use network-provided time, Use GPS-provided time & OFF), Select OFF. 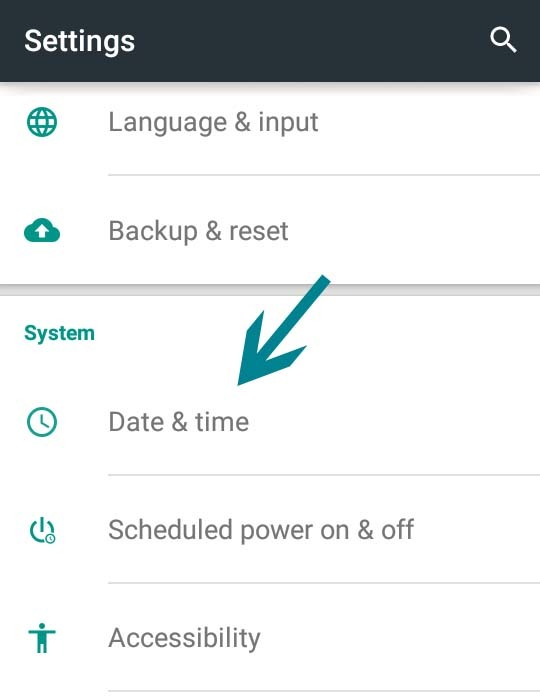 To change the device current date we need this to be SET to OFF. 4)- On the same screen, under “Automatic time zone”, you will find the option “Set date”. TAP / Click to it and select any previous date from the calendar. After selecting the previous date, hit to the OK button. CONGO, desired device date has been changed. 5)- All Done 🙂 , Reboot / Restart the device and start using the Obsolete WhatsApp version without up-gradation or installation. Tips for selecting the Previous date to access / open WhatsApp Obsolete / Outdated Version. 1)- Just check the date on which the current WhatsApp version became Obsolete. While selecting the previous date, make sure that the selected date is not more than 30 days back. For example, if your WhatsApp version became Obsolete on December 30 – 2016, please don’t select any previous date than November 30, 2016. 2)- The best practise is to select 1 week earlier date from when the WhatsApp version became Obsolete. 3)- Avoid implementing the large difference between the current & previous date as it may repeatedly show you the “Obsolete WhatsApp version” error screen. No need to change the TIME in any case. For better / easy understandings, it would be perfect to select December 23 – 2016, if the WhatsApp version became Obsolete on December 30 – 2016 (as shown on the WhatsApp Obsolete version error screen). We hope that the concept is fully understood now. Temporary Drawbacks / Side effects of changing device current date to access / open WhatsApp Obsolete Version. 1)- You may find some applications misbehaving due to this “device date change” act. 2)- You may get error message “Your connection is not private” in the Internet browser using this “device date change” procedure. 3)- You may miss important Alarms & Reminder due to “device date change” implementations. Please don’t think of using this TRICK if your Marriage Anniversary OR your Spouse Birthday is on the way (within a week time) 🙂 . As declared earlier, all these side effects are temporary. Once you roll back to the original state (current date) things will get working in normal manner. Don’t get afraid of the “Attackers might be trying to steal your information” things as this is only due to the incorrect date we had set to run the Obsolete version of WhatsApp. Mainly you will get these type of warning messages while visiting the websites using Hyper Text Transfer Protocol Secure (HTTPS) protocol. The warning message is the result of the date mismatch at the website server and at the user device. 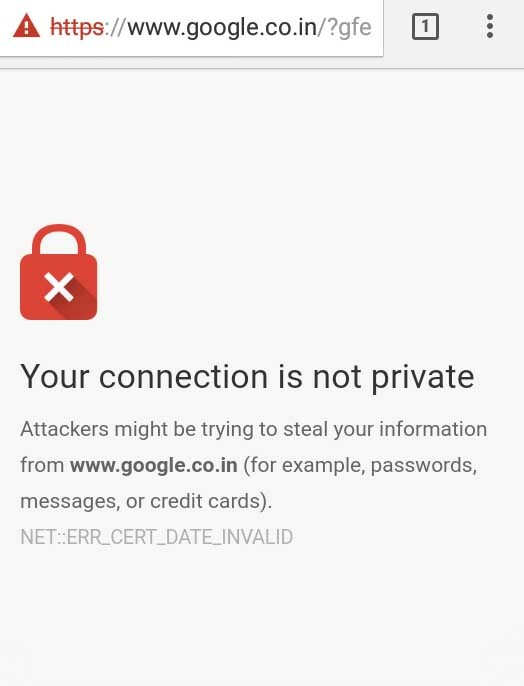 Due to this date mismatch, the system is guessing the SSL certificate expired. Note: We repeat All side effects are for the temporary phase till you roll back to the current actual date. Today the visitors has learned to open WhatsApp Obsolete / Outdated version. There is no doubt, installing the updates / upgrading the Obsolete WhatsApp is the easiest method to get rid of the problem. Just in some special conditions, there is a way to get rid of the problem and access / open WhatsApp Obsolete version for some short time. With this, we are ending this now. Hope you have been benefited by this TRICK. 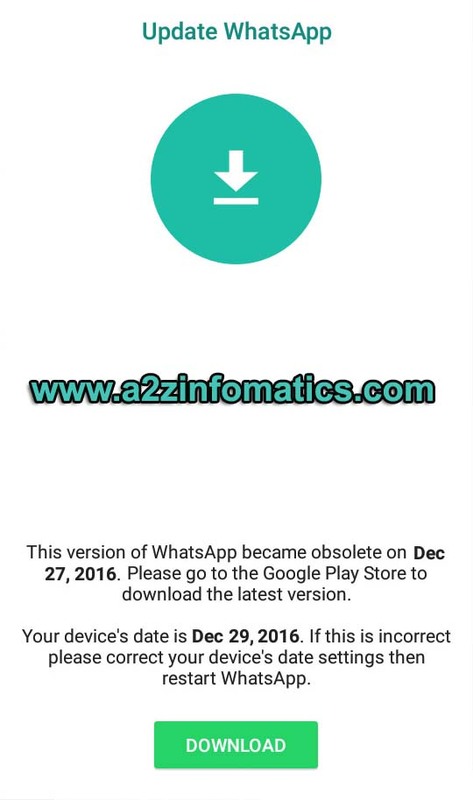 Please do share your experiences about Obsolete WhatsApp or any other related trick which can be useful for the a2z infomatics reader. Thanks for the readings, please take good care of yourself. a2z infomatics is nothing without our readers, Happy New Year to all of them. The second part worked for me. Though the dates remain the same the time changes But this is nothing compared to the conversations you have to make.